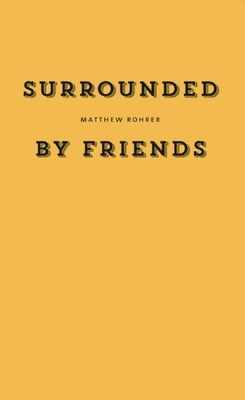 The poems in Matthew Rohrer's seventh poetry collection are generated by, and embrace, friendships with the living, the dead, and the inanimate. Friends, family, and the urban peoplescape are gathered together in these poems, with more and more poetic voices joining in, and ending with poems written "in collaboration" with Kobayashi Issa, Yosa Buson, Matsuo Basho, and Hafiz. Matthew Rohrer has received the Hopwood Award for poetry, a Pushcart Prize, was selected as a National Poetry Series winner by Mary Oliver, and was shortlisted for the Griffin International Poetry Prize. He is the co-author, with Joshua Beckman, of Nice Hat. Thanks., and the audio CD Adventures While Preaching the Gospel of Beauty. He has appeared on NPR's All Things Considered and The Next Big Thing. He lives in Brooklyn, New York, and teaches at NYU. Matthew Rohrer is the author of Destroyer and Preserver (Wave Books, 2011), A Plate of Chicken (Ugly Duckling Presse, 2009), Rise Up (Wave Books, 2007) and A Green Light (Verse Press, 2004), which was shortlisted for the 2005 Griffin Poetry Prize. He is also the author of Satellite (Verse Press, 2001), and co-author, with Joshua Beckman, of Nice Hat. Thanks. (Verse Press, 2002), and the audio CD Adventures While Preaching the Gospel of Beauty. He has appeared on NPR's All Things Considered and The Next Big Thing. His first book, A Hummock in the Malookas was selected for the National Poetry Series by Mary Oliver in 1994. He lives in Brooklyn, New York, and teaches at NYU.